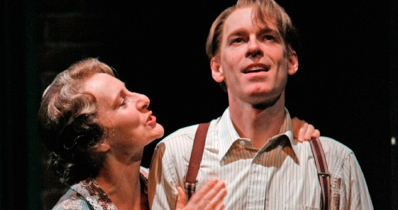 Tennessee Williams’ “The Glass Menagerie” is one of the most produced of all American plays. It is a great play, but the fact that it requires only four actors and one set means it crops up far more often than other equally worthy plays. CanStage mounted a production just last year and in 1997 in Toronto there were productions running simultaneously at the Tarragon and at the Royal Alex. Yet, there is always room for a good production and the current one at Stratford, while not perfect, features fine performances and has much to recommend it. One of director Miles Potter’s best achievements is to make the Wingfields, a family from the Deep South, dislocated to St. Louis, Missouri, feel like a real family. Potter reinforces Williams’ text with silent gestures. Glances or avoidance of eye contact among the mother Amanda and her children Tom and Laura depending on the subject matter under discussion and contemplation of themselves in a full-length mirror in the hallway and of the portrait of the father who abandoned them show that the Wingfields are all united by dissatisfaction with their present condition and haunted by a tragedy none of them understands. For once, the design makes some attempt to illustrate the narrator Tom’s claim that the play is “memory” and therefore “not naturalistic”. At key moments Potter allows lighting designer Kevin Fraser to illuminate Peter Hartwell’s otherwise naturalistic set from behind to show it up as merely cloth stretched over wooden frames while turning the actors into mere shadows. Periodically the portrait of the absent paterfamilias glows thus literally highlighting the pall his absence has cast over the family. Otherwise Fraser casts a warm golden glow over the set as if the Wingfields’ apartment were an ember about to die out. Hartwell’s design suggests that the Wingfields have retained a few prized items of furniture from their past life, but does not really capture the shabbiness bordering on poverty in which the family lives. In this he follows the peculiar Stratford design rule (as in “Coriolanus” and “Oliver!”) that presents poor people as picturesque rather than as dirty or ragged. Hartwell has Amanda return from a D.A.R. meeting in two-piece ensemble and a fur-collared coat that show no sign of wear. Even the old-fashioned gown Amanda digs out for the arrival of the gentleman caller shows no signs of expected ageing or yellowing. The play is anchored by a subtle, highly detailed performance by Steven Sutcliffe as Tom. His gentle Southern accent and fey demeanour and delivery help relate the character in Williams’ most autobiographical play back to Williams himself (whose real name was Tom) and his homosexuality. These suggestions of Tom’s gayness help explain more than the character’s writing poetry why other men at the warehouse where he works avoid him, why he “goes to the movies” so often and why he has such a need to escape his family. Sutcliffe brings out the full poetry of Williams’ poetic prose with masterful use of pauses to enhance emotion and effect. As Amanda, Seana McKenna gives a wonderfully warm performance. Her accent, as one would expect, is stronger that Tom’s and makes her seem even more out of place--a Southern belle in a box of an apartment. Under director Miles Potter, she captures the aspects of Amanda that evoke both ridicule and pathos at the same time. Her love of polysyllables, her ineffective attempts to inculcate proper behaviour and her unstoppable volubility on the subject of grandeur of her past are all undercut by the realities of the present and her own decision to marry the least suitable of her many “gentleman callers”. In some productions Amanda’s love for her children appears stifling, but here it seems part of genuine if desperate attempt to atone for the decision that led her family to its present destitution. Matthew McFadzean, making his Stratford debut as Jim O’Connor, the Gentleman Caller, gives the character an edge one seldom sees. He makes Jim, straight from his self-improvement classes, come on too strong at first, as much in his way as Amanda does in trying to impress him. There is no sense, as in some productions, that he falls in love with Laura, but rather that he finally steps down from his posturing long enough to feel pity for a girl who so hopelessly admires him. MacFadzean makes Jim’s enthusiastic speeches about the glorious future show that he is as much of a dreamer as the Wingfields are. Sad to say, but the one person who seems miscast is Sara Topham as Laura. She has been so impressive in so many other Stratford productions it seems a surprise, but the previous characters she has excelled at have all been passionate, witty or extrovert, just the opposite of what makes Laura who she is. While all the other actors effortlessly inhabit their roles, one senses Topham’s conscious effort to restrain her gestures and speech. Laura is Tom’s older sister and should have an accent at least as strong as his, but Topham makes no attempt at one. Her Laura stares blankly in the distance but that is not enough to convey the character’s fragility and otherworldliness. Potter has emphasized the play’s humour far more than is usual. He may be trying for a kind of Chekhovian “laughter through tears” but it does rob Amanda’s speech of desperation after the Gentleman Caller departs of the shock it should have. At that point the mask she has been wearing drops and she sees that she and Laura will literally and symbolically have to confront a lightless world. Yet, Sutcliffe’s final summation as Tom is so emotionally raw it refocusses the play on tragedy and regret and his request to Laura to “Blow your candles out” has all mixture of love and pain in it of someone deciding to remove a loved one from life-support. After so much humour, the sadness at the end takes you by surprise and makes you realize that despite its flaws Potter and his actors have made this familiar play seem new. Photo: Seana McKenna and Steven Sutcliffe.